The former Treasury building is one of the nine heritage buildings to be repurposed and opened up to the public as part of the transformational Queen’s Wharf project. This beautiful heritage building was built over three stages between 1886 and 1928 and currently operates as a casino. The building was formerly a place to rule and legislate with several government people and departments having occupied it. At the turn of the century, the Treasury building served as a symbol of self-government and as a focus for celebratory and patriotic displays. 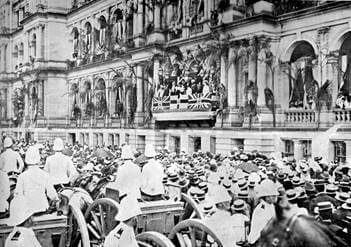 Of all the celebrations involving the building, none was more elaborate or significant in socio-political terms than the Royal Proclamation advising of the formation of the Australian Commonwealth read by then Governor of Queensland Lord Lamington from a balcony on William Street on 1 January 1901. The event signified the six separate British self-governing colonies of Queensland, New South Wales, Victoria, Tasmania, South Australia, and Western Australia uniting to form the Commonwealth of Australia. We therefore by and with the advice of our Privy Council have thought fit to issue this Royal Proclamation, and we do hereby declare that on and after the first day of January one thousand nine hundred and one, the people of New South Wales, Victoria, South Australia, Queensland, Tasmania and Western Australia shall be united in a Federal Commonwealth, under the name of the Commonwealth of Australia. Following the reading, around 300 children sang the National Anthem, God Save the Queen, and proceeded to present Lady Lamington with flowers. After the festivities, a crowd formed a colourful procession down Queen Street and on to the Exhibition Grounds. Come 2022 when Queen’s Wharf Brisbane opens, the casino will relocate to the new arc sharped building in the centre of the Integrated Resort Development, making the Treasury building available for redevelopment. This historical building that has stood the test of time and holds a moment in history that can never be repeated, will again be transformed, this time into a high-end retail precinct and hotel rooms for the luxury The Ritz-Carlton hotel.